Hey all, here is a card using a freebie from winnie&walter, it is sitting to be used for almost 2 years now. The freebie is called 'dizzy' I don't have any stamps from them yet, as not available in my part of the world. I asked the craft store to look into getting, but they still haven't got these. Anyways, I printed it on a water color color paper, and used Staedtler's mars graphic 3000 water brush markers to add in the colors using 3 different shades of green. I added gold glitter at the center of the squares. The maple leaf is from my stash, I sponged it with distress inks, very light hand this time, yo will notice that the colors are very different from my usual maple leaves! it is fussy cut and added using a foam adhesive. The acorns are from a small stamps, bought locally in Hong Kong. I stamped using vintage photo and used the zigs to add color and fussy cut o add. The sentiment is from Uniko, and I finished off with a grey glitter strip, and a green textured base. It looks quite alright I think ;) , what do you guys think?? I was inspired by Emily's card - just the leaves, even though I have one leaf on my card. Used the freebie for my background. Another entry for the Thanks. I have distress ink for sponging the leaf. I am hoping with stamping, glitter, water color, fussy cuts, and texture, this card is a fit for mixed media. I think the card looks amazing! I love what you've done with the background - those beautiful greens with a touch of gold looks spectacular!! an amazing background design! I am so glad you played along with us at simon says stamp wednesday challenge! I love the vibrant colours and graphic look on this fab card. 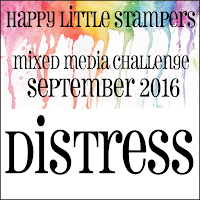 Thanks for sharing with us at Happy Little Stampers Mixed Media Challenge. love the graphic design and the vibrant colours. That's beautiful! Thank you for joining us at the Bastel-Traum.ch Challenge! Great card and use of the background and take on Emily's card, Rahmat! Thank you so much for joining us for the Rerun Challenge.